While I was en route to another booth whose name escapes me at the moment, I happened to walk through the Leapers booth, which was quite ginormous, so I figured, "Hey, what the heck?" I like a number of their products, so I thought I'd stop and see what kinds of new things they have coming out. I snagged a Leapers rep and away we went. I was in a hurry, as I recall I had to be somewhere at sometime for something, but again, I don't remember. 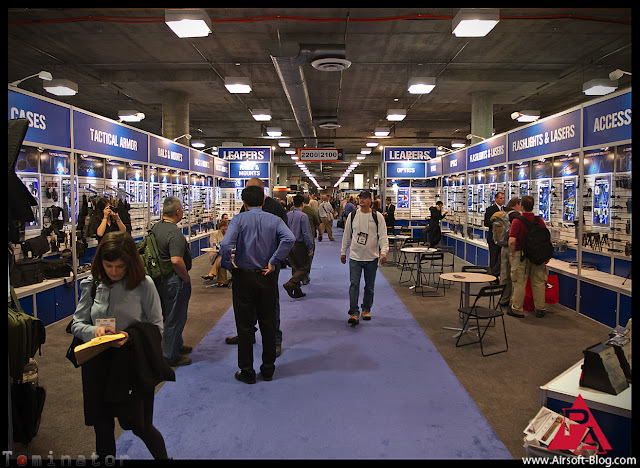 'Twas a Shot Show blur. Anyway, so I told the guy to pick like three or four of his most exciting new items to show me. 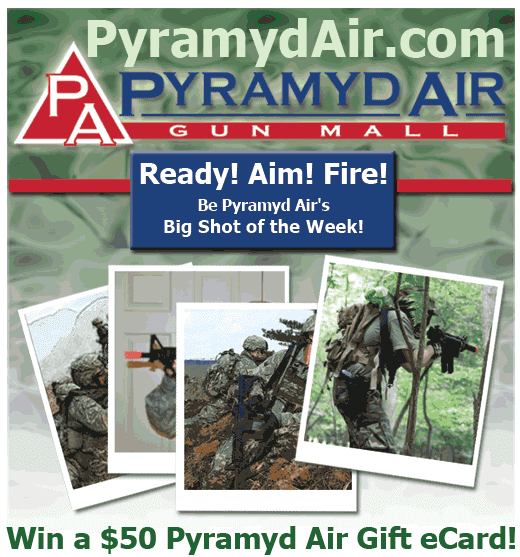 One of the first items was a new laser aiming device that enlarges the beam of the laser as the distance to your target increases so as to increase visibility of the laser. However, looking back, I see that as much more of a hunting tool than for Airsoft (they also seemed to be marketing it for that, considering there was a 12-point buck on their literature). 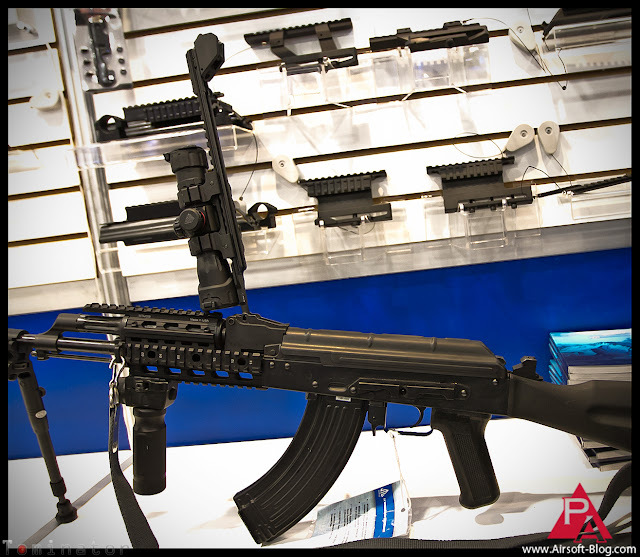 So next, he took me over to see their new AK-47 tactical RIS adapter. This was an interesting thought. Normally, AK-style scope mounts attach to the side of the gun facing you in the picture below. 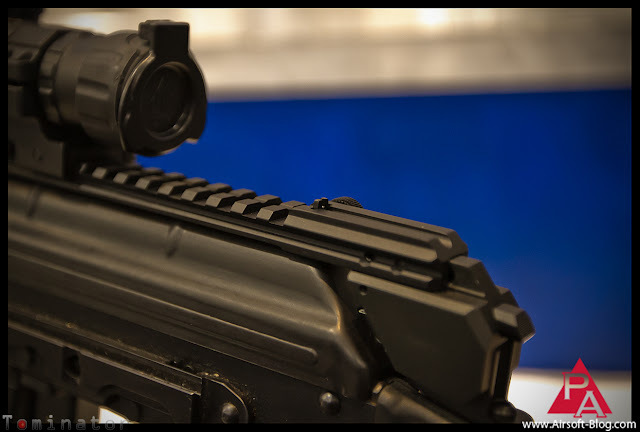 However, this one replaces the rear sight of the gun on the front end, and on the back end of the RIS, there is an attachment piece that sits on top of the base of the stock. 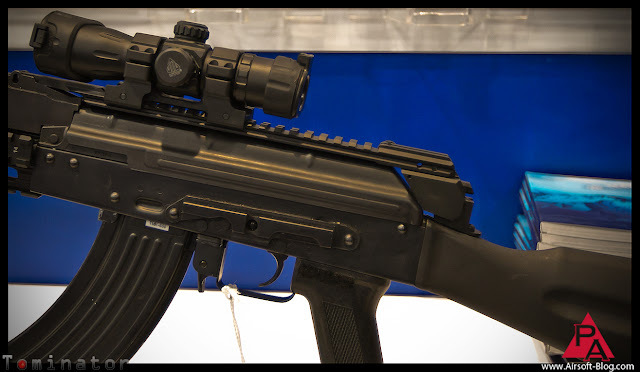 So not only do you get a bit more rail space than your average AK scope mount, but in the event you need to pop that top plate of the receiver off, you no longer need to remove the scope mount and/or scope to do so. This is not only convenient in this regard, but even more so in that you don't have to re-zero your scope after you've got the gun put back together. Always nice! They've even gone to the trouble of adding a small, super low-profile rear sight since you had to remove the original in order to install the stock. The question will be whether you can get enough line of sight through that sight with a full face mask or goggles & lower mask on. Is this super crazy innovative? Not in my opinion, but definitely shows some thought went into its design. 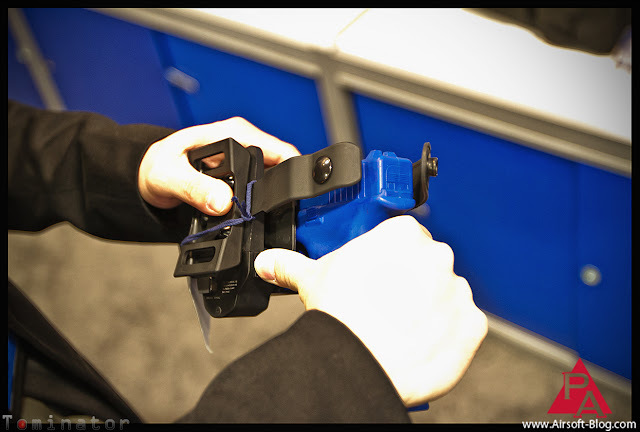 Next we have what is essentially the new Guarder G-series holster. The "G" in "G-series," however, I think refers to Glock, rather than Guarder. But I could be totally wrong. I'm really kind of speculating at this point. 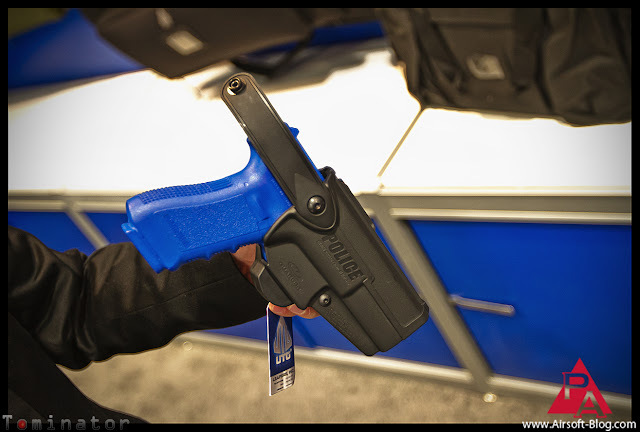 It's similar the famous/infamous Blackhawk SERPA holsters in that you have to press a button to release the gun and draw it from the holster, however, instead of your index finger, you'll be using your thumb. As soon as the guy mentioned this, I was like, "Hmmm. That's interesting. 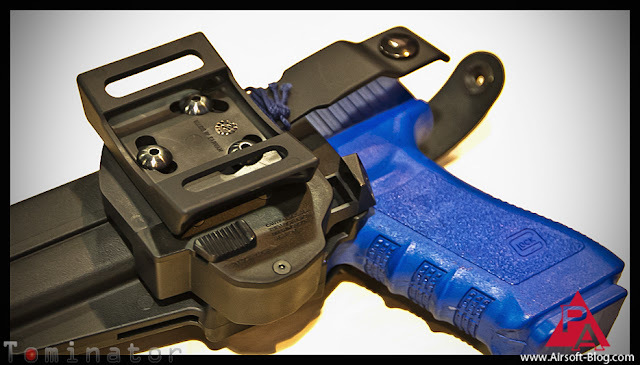 5.11 Tactical makes a Thumbdrive Holster which requires the same technique." The two holsters appear to be different enough in overall aesthetic design that I didn't really think about it much more than that. 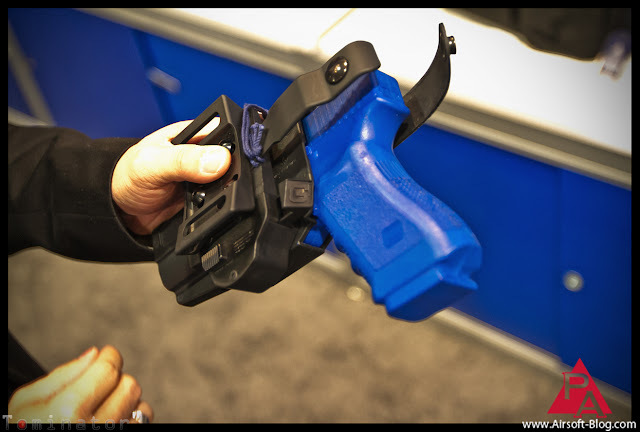 So, he began showing me the last feature of the holster, which is a locking switch on the inside of the item, which is designed to be engaged whenever the operator feels there is a risk that someone may try to take the gun from their holster. When the switch is on, even pressing the release button with your thumb will not allow anyone to draw the gun from the holster (including the operator, for better or worse). As he was showing me this last feature, I happened to look over at the wall where a few of their bags were on display when I saw a VERY familiar sight. This bag. 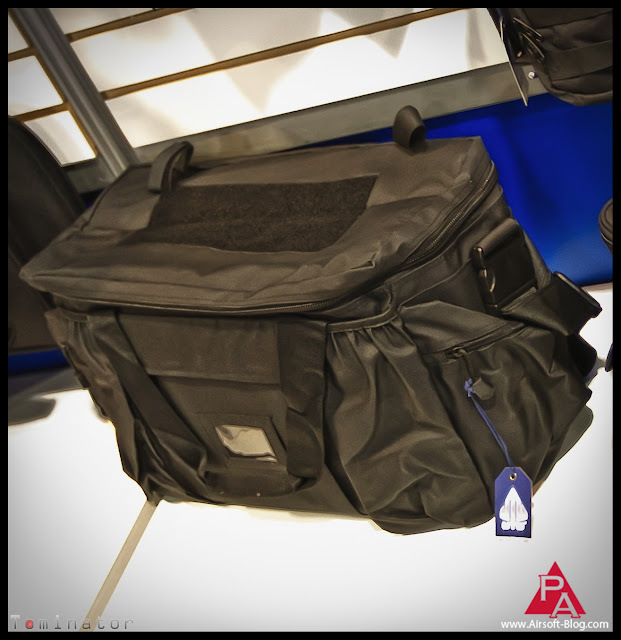 This is almost exactly the same bag that I was currently using to transport all my camera gear around in while at Shot Show 2012. At the time I was at the booth, however, I had checked it into the Media equipment storage area, so I didn't have it for comparison. You might be wondering, "So what?" 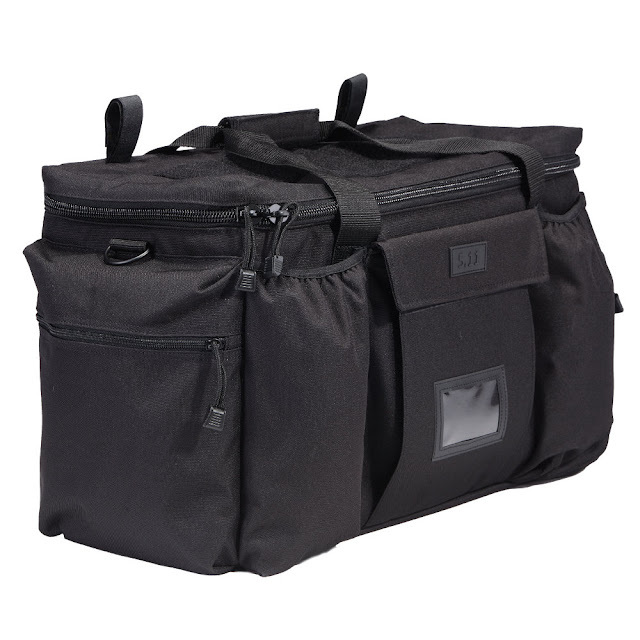 Well, the interesting thing is that I own the 5.11 Tactical version of this bag, aka the Patrol Ready Bag, and I am pretty darn sure that they did not partner with Leapers to produce this bag. The primary differences are that A) the Leapers bag obviously does not have the 5.11 PVC patch on the front, center pocket flap B) the pull tabs on the zippers are different and C) the attachment hardware for the shoulder strap are different. But that's about it. Now, as of right now, I haven't confirmed anything with 5.11, but I wouldn't be surprised if this is a total rip-off of the 5.11 bag. It's not unheard of for a Chinese manufacturing facility, which is where some of 5.11's gear gets made, to simply sell the design to Leapers, once they made a few for 5.11. Of course, I could be WAY off here, so don't jump on my throat too badly, my blood-thirsty readers. I just found it rather interesting, especially in light of what unfortunately happened at the Jag Precision booth regarding alleged (innocent until proven guilty, remember?) trademark design infringement.